We are pleased to offer a selection of properties for sale at Aphrodite Hills. To discuss your requirements, current availability and pricing simply enquire now and we will be happy to assist you in purchasing a home at Aphrodite Hills, Cyprus. Bank arrangement fees .50% on loan amount. Documentation fees €75. Reduced VAT for new properties; first time buyers of new properties will be eligible to be charged at 5% VAT on the value of the purchase instead of the normal rate of 19% VAT. Total covered area not more than 327m² – VAT 5% for the first 200m² and 19% for the remaining area of up to 75m at 52m is deductible. Properties over 327m² attract 19% VAT. No transfer fees / registration fees; buyers of new properties who are charged with VAT and purchased prior to 31/12/2016 will be exempt from paying any transfer / registration fees at the time of the transfer and registration of the property in their name. No capital gains tax for new properties; buyers of new properties who are charged with VAT and purchased prior to 31/12/2016 will be exempt from any capital gains tax at the time of the sale of the property at any time in the future. Investment in real estate of at least €2 million including one property for permanent residence, of at least €500,000..
Properties at Aphrodite Hills are located in a series of villages within the resort. We are pleased to sell properties within Aeneas Grand Villas . 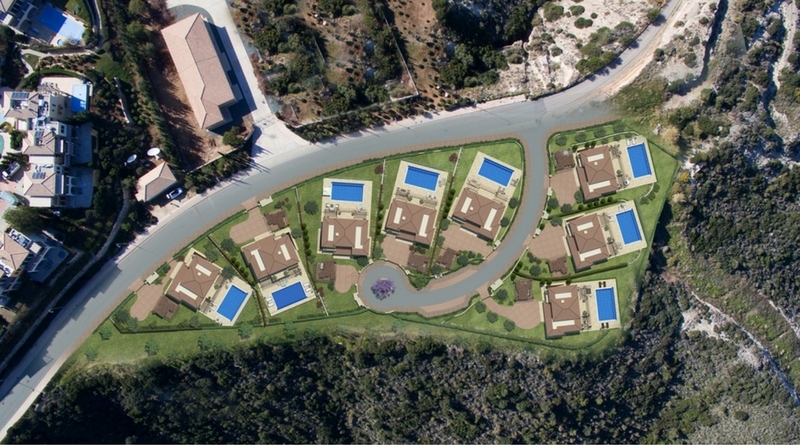 The villages are within walking distance of the village square, and each has its own communal pool for residents and guests. The Aeneas Grand Villas are a beautiful collection of just 8 luxury four bedroom villas situated in a elevated position overlooking the Mediterranean Sea, within easy walking distance of the resort’s facilities. The ultra-luxurious, detached villas are fully furnished to the highest standard and feature their own landscaped gardens and large private pools. Every home at Aphrodite Hills is finished to uncompromising standards with impeccable attention to detail. The highest quality Italian style kitchen units, lavish Crema Royal Marble bathrooms and marble parquet floor features throughout.